Toby is an artist in every sense of the word; this marks the third collaboration with Toby. Toby was involved in every step of the project from conception, design, development and deployment of the website. This version is completely managed by members of Toby’s team, including adding artists entries including audio & videos, and adding news updates, charts & accomplishments. These are just some of the stunning accomplishments in Toby’s career. #1 Billboard Top 100, 8x Platinum. 21 weeks at #1 US var. Billboard Charts, #11 song of the decade. #1 in 9 countries, Platinum, #68th best selling single of the decade. Toby Gad is a Danish-born music producer and songwriter. Since the age of 7 Toby was making and performing music, and at just 18 years old had his first platinum success with Milli Vanilli. 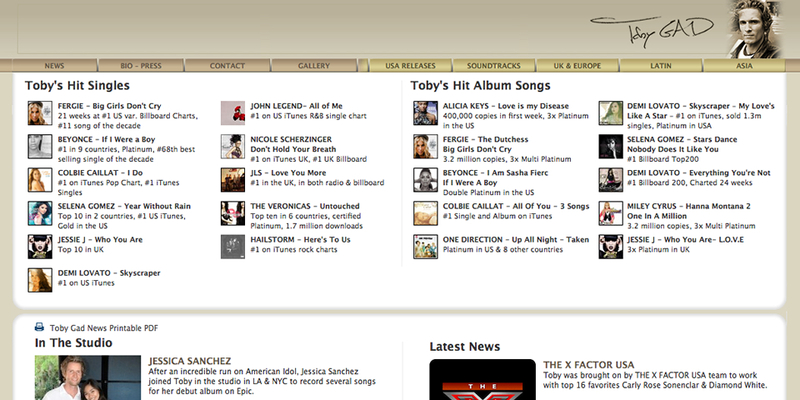 After great success in Europe Toby moved to the US, where he penned #1 hits for Beyonce (If I Were A Boy), Fergie (Big Girls Don’t Cry), and many more. His songs have received two Grammy Awards and many other accolades. He continues to write and produce in Los Angeles, where he resides with his wife and two daughters.